TAVISTOCK (NZ) (Bay 2005-Stud 2010). 6 wins-1 at 2, Waikato Draught Sprint, Gr.1. Champion Sire in Hong Kong in 2015-16. Sire of 286 rnrs, 183 wnrs, 17 SW, inc. Werther (HKJC Audemars Piguet Queen Elizabeth II Cup, Gr.1), Tarzino, Tavago, Volkstok'n'barrell, Tavidream - Circuit Glory (H.K. ), Hasselhoof, Tomelilla, Hiflyer, Gobstopper, Pacorus, Infantry, Avisto, Longchamp, Nymph Monte, Won Won Too, Tavy, Titanium, SP Tavisan, Milseain, etc. Paparazzi Dreamer (f. by Exceed and Excel). 5 wins-1 at 2-to 1300m, A$112,628, MRC Catanach's Jewellers 2YO H., Cove Hotel H., 2d MRC (Mornington) International Truck Centre H.
Soloist (g. by Stravinsky). 5 wins from 1200m to 1600m, ARC Yamaha Hi-Fi H., Singapore TC Class 3 H., Class 4 H., 2d Singapore TC Panasonic Systems Professional S., ARC Legends Fellowship H., Singapore TC Class 3 H., 3d ARC Auckland Co-Op Taxi's H., CJC NZI H., Singapore TC Class 3 H.
One Touch (g. by Cape Cross). 3 wins at 1600m, 1650m, HKJC Tai Mong Tsai H., Shing Mun River Channel H., Garden H., 2d HKJC Jackson H., 3d HKJC Hydrangea H.
One Way Ticket (g. by Tavistock). 2 wins. See below. Our Showgirl (f. by Ego). Winner at 1300m in 2017-18, 3d Avondale JC NZB Insurance Pearl Series S.
El Bimbo (f. by Elusive City). 2 wins at 1200m in NZ. Sheselusive. 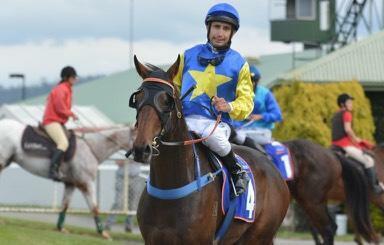 Winner at 1200m, 3d BOP RC Greg Thurlow Cave Classic H.
Edith Piaf. Winner at 1300m in NZ. Back Again (g. by Any Suggestion). Placed at 3 in Aust. CONFISCATE (Sir Tristram). 12 wins-1 at 2-to 1500m, A$595,171, VRC Yallambee Stud S., Gr.3, STC Concorde S., Gr.3, Frederick Clissold H., Gr.3, Ajax S., Gr.3-twice, AJC E Deas Thompson Welter H., STC Salinger Cup, NSW Tatt's RC At Sea Quality H., VATC Festival Supermarkets H., Hawkesbury RC Clarendon Cup, AJC Birdcage H., VATC Blazing Saddles 2YO H., 2d Newcastle JC Newmarket H., Gr.3-twice, AJC Flying Knight Welter H., STC Fiji H., 3d VATC IGA S., Gr.3, BTC Sprint H., Gr.3, STC Woronora Welter H., 4th STC Phar Lap S., Gr.2, QTC Ascot H., L.
SARAH FAY (Sir Tristram). 5 wins-1 at 2-from 1000m to 2100m, NZ$80,210, A$69,970, AJC Craven P., L, HBJC Havelock North Auto Court H., Waikato RC Fairview Motors H., Matamata RC Auckland Racing Club City Cup, 2d Manawatu Breeders' S., Gr.3, 3d New Zealand Oaks, Gr.1, ARC Unigroup Developments H., Gr.3, AJC Grafter Welter H., 4th Avondale JC Castle Express Classic S., Gr.3. Producer. Strafed - Cypress Hill (H.K.) (Quest for Fame). 3 wins from 1650m to 2000m, A$115,250, HK$683,700, VRC The Curragh H., Skipton H., HKJC Shouson Hill H., 2d STC Tulloch S., Gr.2, MRC Thrice H., 3d MRC Autumn Classic, Gr.2, MVRC Alister Clark S., Gr.2, Business Network Luncheon H., HKJC Cotton Tree H., 4th AJC Frank Packer P., Gr.3. Clowns. 7 wins from 1800m to 2050m, A$194,800, VRC Rod Johnson H., Heaven Extras H., MVRC Andale Beer Dispensing Equipment P.H., AJC Bexley H., STC Invermien Stud H., 2d VRC Antler Luggage H., 3d VRC Piping Lane H., Tooheys Extra Dry H., MVRC Saintly H.
Showzeel. 2 wins. See above. Blithe Rhythm. 2 wins at 1200m, 1400m, SAJC Lord Dudley H., 2d SAJC Mick Armfield H., VATC Lyndhurst H., 3d VATC Rivette H. Producer. EASTERN CLASSIC (Balmerino). 18 wins from 1100m to 2200m, A$719,370, AJC All-Aged S., Gr.1, STC Hill S., Gr.2, VRC Grey-Smith S.H., L, SAJC John D Lee S., L, OJ Smith Challenge S., L, VATC Eclipse S., L, Kilmore Cup, L, VRC Changi H., 2d VRC Ampol S.H., Gr.1-twice, AJC Warwick S., Gr.2, VATC St George S., Gr.2, Eclipse S., L, Kilmore Cup, L, 3d WATC Winfield S., Gr.1, SAJC Spring S., Gr.2, Japan Trophy H., Gr.3, MVRC Waterford Crystal Mile H., Gr.3. Western Classic (Sir Tristram). 2 wins at 1200m, 1800m, VRC Puma H., Chicola H., 2d Australasian Oaks, Gr.1, VATC Surround H., VRC Bletchingly H., Dimattina Arcadia Tomato H. Producer. Goldrim (Centro). 3 wins at 1200m, 2d CJC South Island Thoroughbred Breeders' S.H., L, Unichem Barrington H., 3d CJC AMP Banking H., Westland RC Miss Scenicland S. Producer. SILENT PRINCE (Marceau). 16 wins-2 at 2-from 1000m to 2000m, US$88,250, A$122,445, Mornington Cup, L, VRC Charles Grimes H., SAJC Matrice H., Old Cheltenham Grandstand H., 2d Santa Anita San Jacinto H., L.
Race Record: 17 Starts 2-1-1 NZ$9,000, A$16,245. 2 wins at 1600m, 2100m to 2017-18, TTC Australian Trainers Trust P.